E Komo Mai, a Hawaiian Welcome to Serendipity Maui. From casual separates for strolling along the beach, to elegant and timeless dresses for those special occasions, Serendipity’s unique, sophisticated clothing styles are available in sizes XS to 3X. Fall in love with one of Serendipity’s distinctive fabrics, and you will find it in an array of dresses, tops, skirts, and pants so entire wardrobes can be built over time. Many of the designs featured in our stores are exclusive to us...feel free to feel special and fabulous! 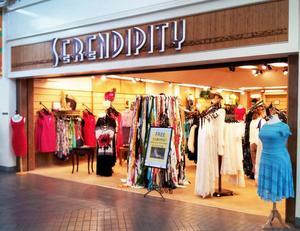 We are located at the Lahaina Cannery Mall and are looking forward to meeting you soon!